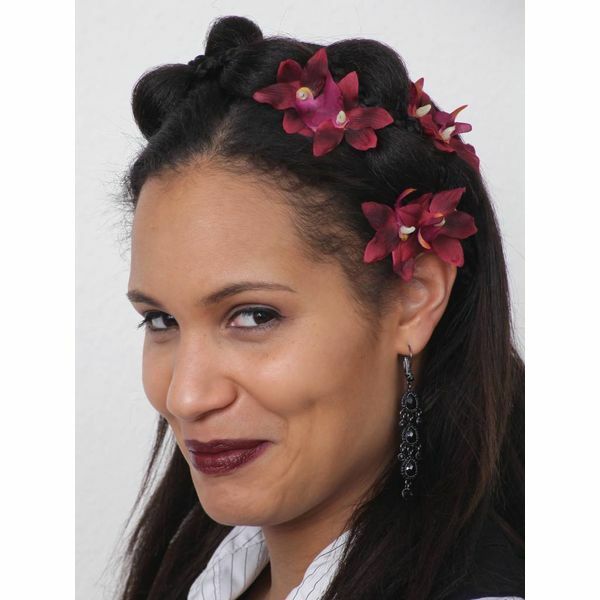 Hair flowers are many in one items: With their professional clip attachment you can wear them as brooches, shoe clips, on rings/arm bands and in many more ways! 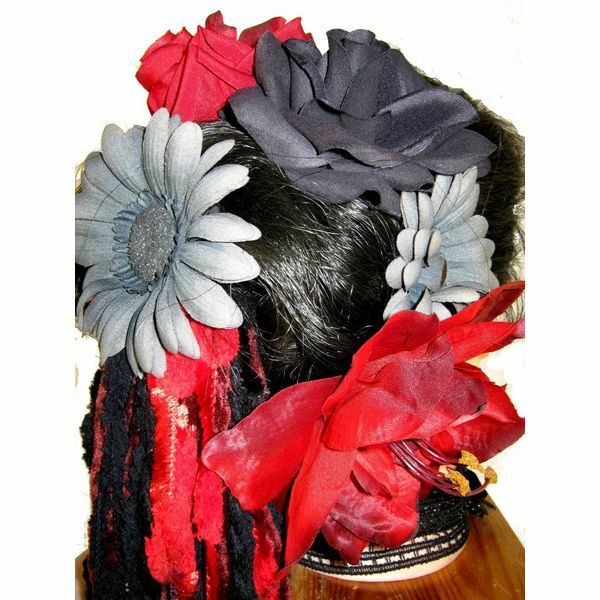 Browse all our hair flowers here at a glance! 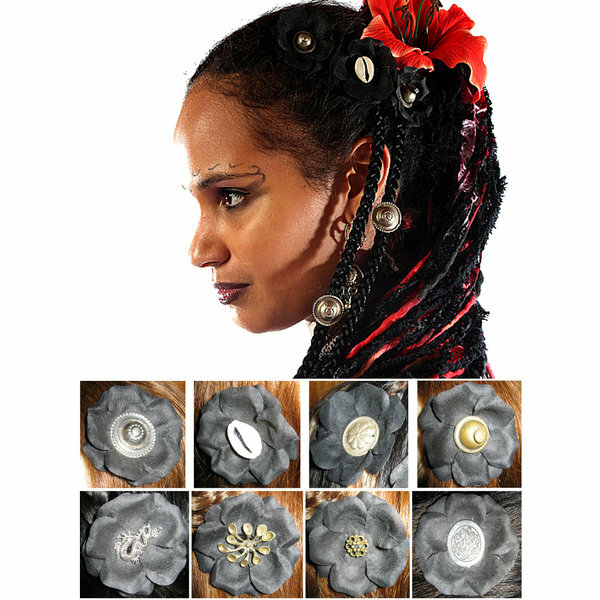 We make classic fabric flowers but also cowry hair flowers made of cowry shells, steampunk and Neo-Victorian style hair flowers of fliligree bronze colored metal and filigree silver hair flowers for Goth styles. All our sets come with a little set discount. 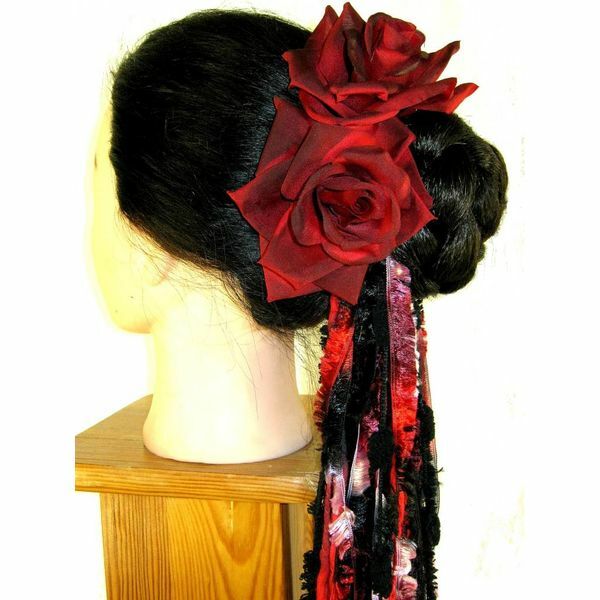 Which hair flower suits my hairstyle? 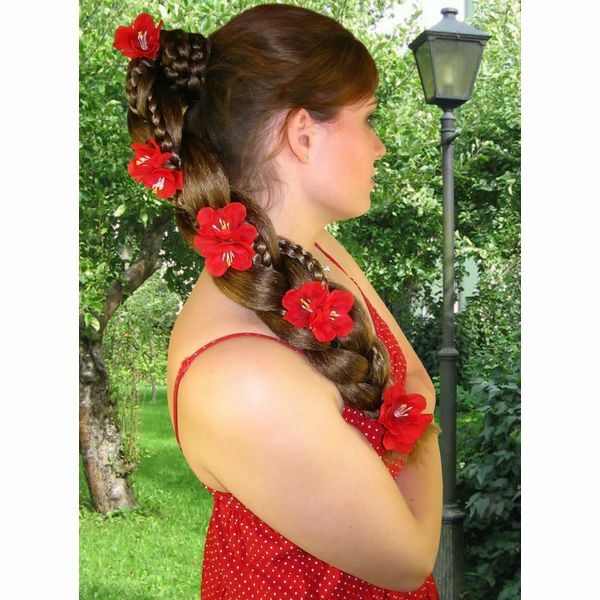 Here are some tips for different hair styles and which hair flowers to pick! 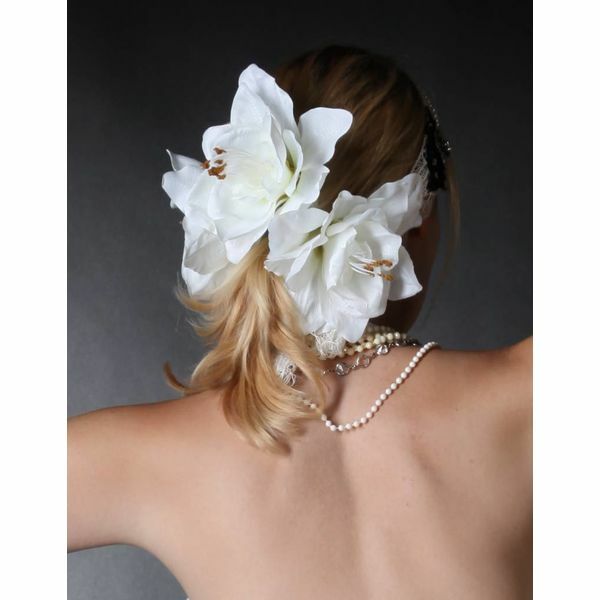 They look best worn at the side of your head. Flat blossoms are pretty, because they cling to your head and don't stick off. 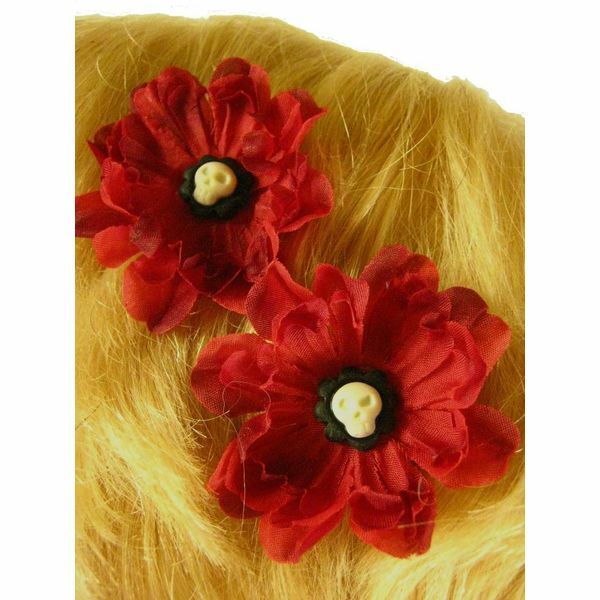 Flat hair flowers match all kinds of hair. 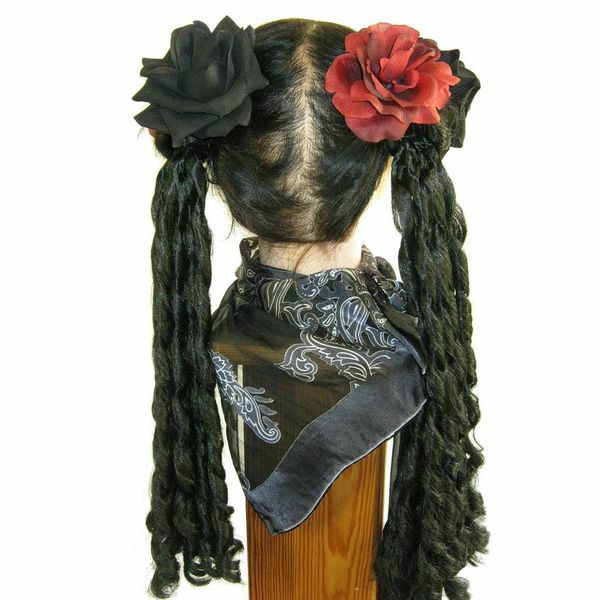 If you have curly or voluminous wavy hair thicker flower hair clips are an option as well, because they sink into the volume of your hair and don't stand off too much. 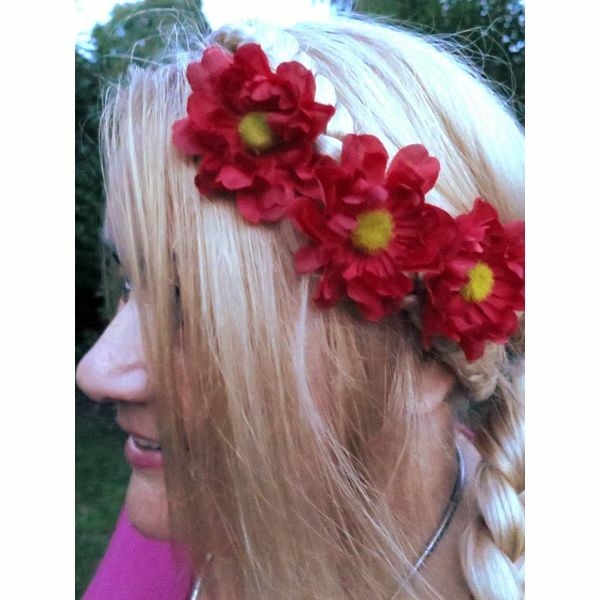 You might prefer smaller flower clips (diameter about 5 cm/ 2 inches) for pulling back single strands of your long hair or your fringe and secure them at the side of your head. 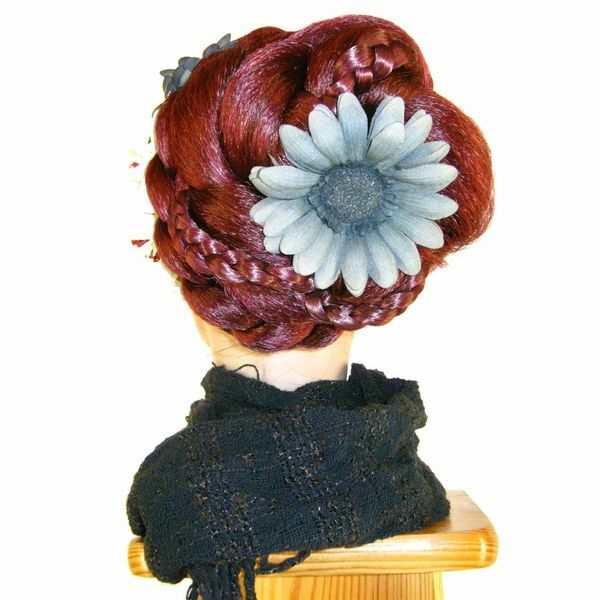 Flowers of all sizes top off your bun hair styles! 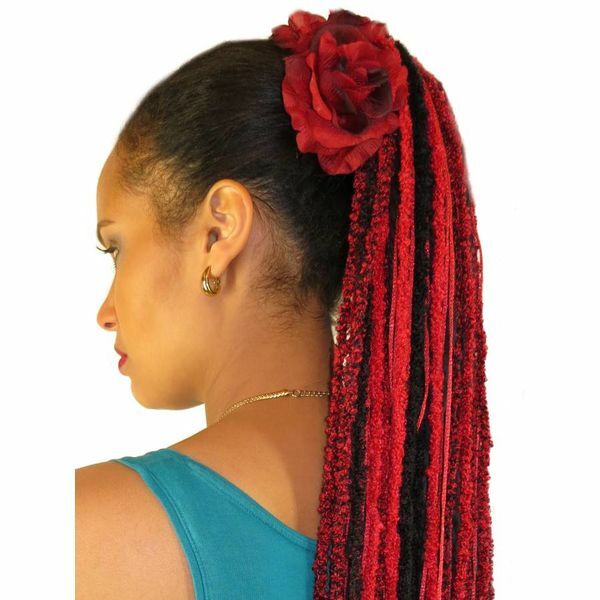 Put them around your bun or even use smaller flowers (diameter about 5 cm/ 2 inches) for decorating your bun all over and for smaller topknots, because larger hair flowers (diameter 10 cm/ 4 inches and more) might hide too much of your bun. 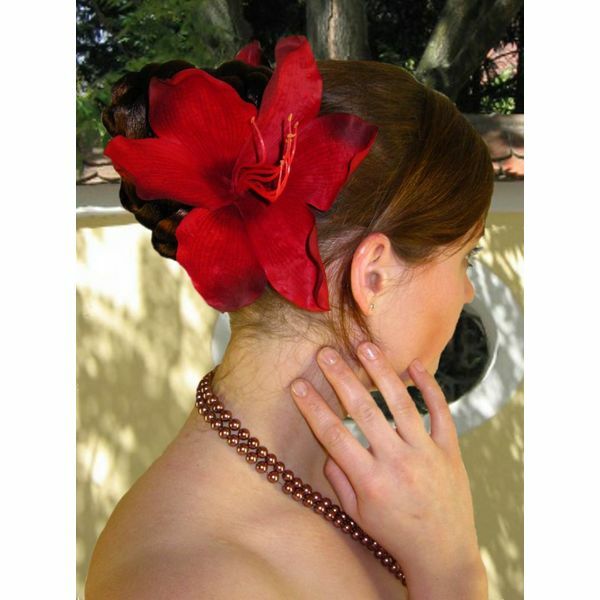 Integrate a single larger flower into a layaered updo in the way that it is a part of your bun! Funnel-shaped flowers like lilies and amaryllis work perfect but also larger, rounder blossoms like roses. 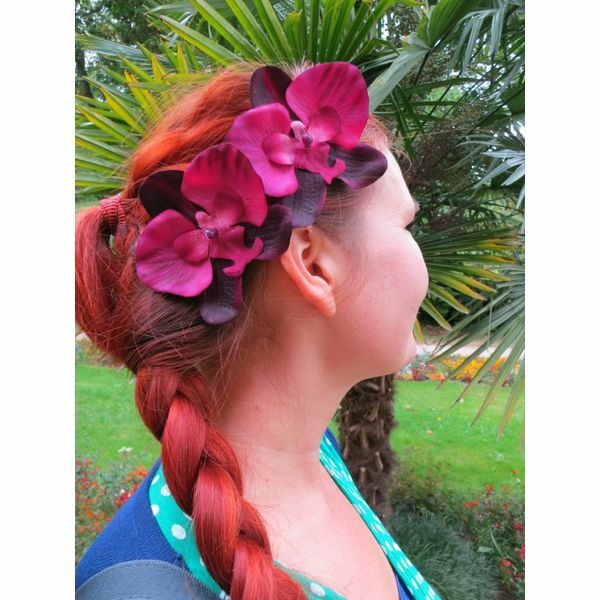 Funnel shaped hair blossoms are also gorgeous when pointing out from under a bun or ponytail or at the side of a larger chignon. 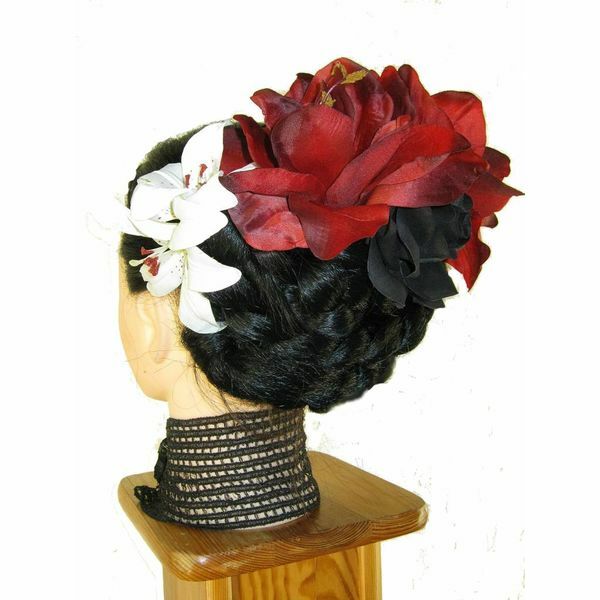 Decorate your braided brad with smaller, flat hair flowers! 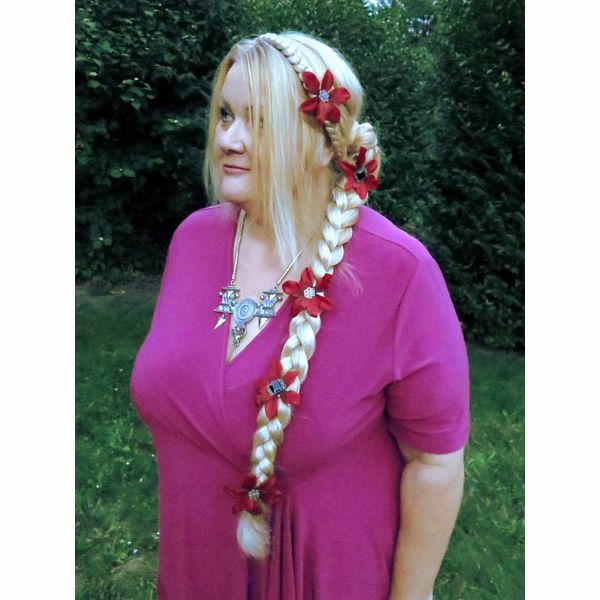 You love halo braid hair crowns? 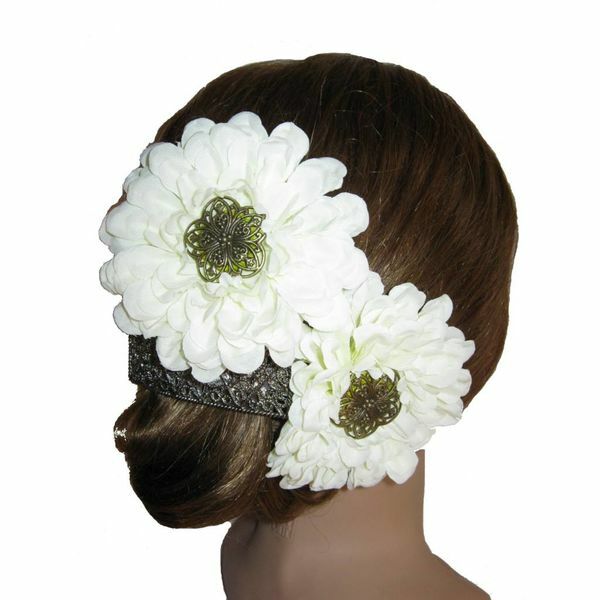 You might want to add some flowers on them, too, for amazing boho and country styles! 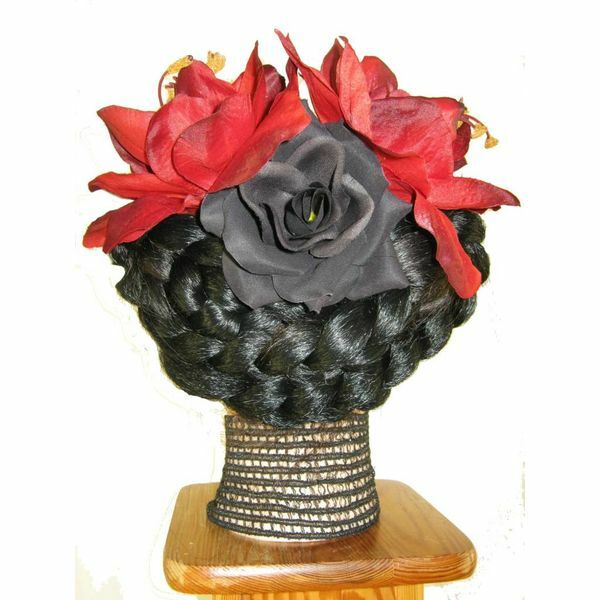 Naturally flower hair clips work on a braid of your own hair and on braid hair extensions, too, just check our many braid styles here! 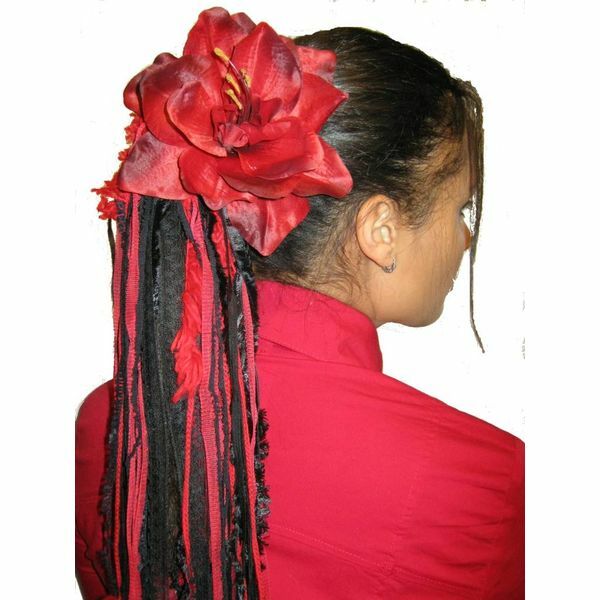 Our hair flowers can do even more! 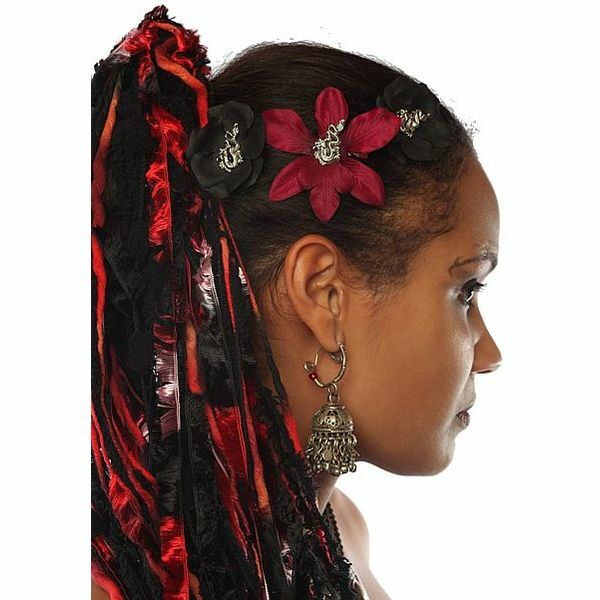 You can use them as shoe clips, bag clips put them on flat rings, earrings and arm bands, wear them clipped onto shoulder straps, collars, ties etc. - get inspired by the picture collage further below! Our professional clip attachment ensures strong hold on flat surfaces and in your hair (minimum hair length 5 cm/ 2 inches). 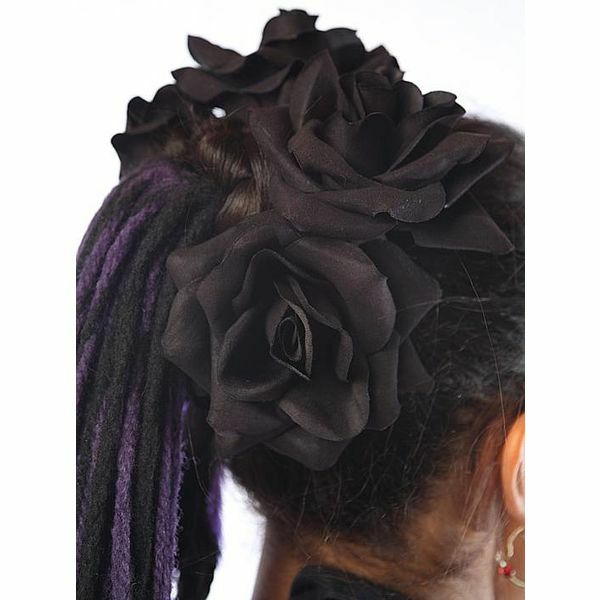 The most popular multi-purpose occasion for our hair flowers is wearing them as flower shoe clips. 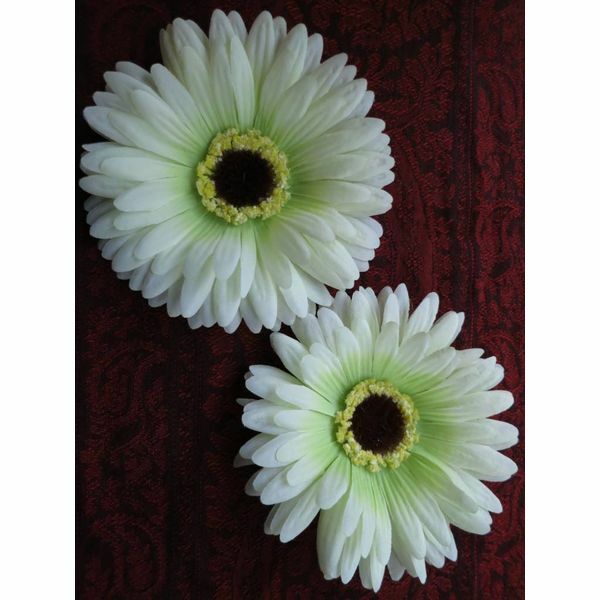 They look gorgeous on ballerina shoes, mary janes and pumps for weddings and other festives and on leather boots, too! When wearing them on boots, you just put them onto the laces after putting your boots on - Gothics love both our filigree bronze and silver flower shoe clips and the bronze ones are perfect for steampunk styles as well. Transform your plain leather boots into unique fashion items just within minutes!